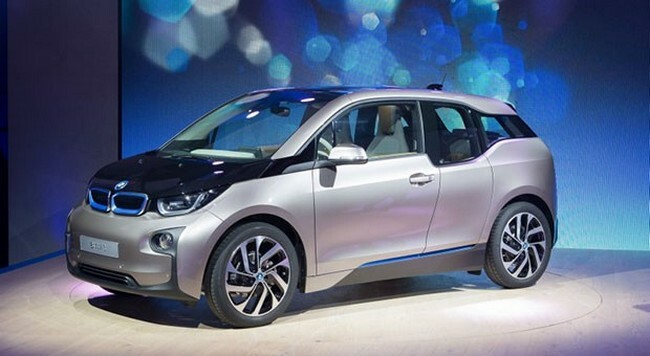 BMW launched it's i3 here in New York City, with simultaneous debuts in London and Beijing. BMW has unveiled its brand new i3 electric car in a trio of synchronous events taking place in the ‘megacities’ of London, New York and Beijing. Built largely from carbonfibre, the 2013 BMW i3 is the world’s first ‘premium’ electric car, but also one of the most technologically advanced vehicles on sale. Designed to provide a zero emissions solution chiefly aimed at city centre dwellers, the new i3 goes on sale in November, priced from £25,680 (approx. $39,000). However, a Range Extender version complete with on-board generator will also be offered for those who want to travel further. Is this the future of the car? The BMW i3 is a ‘compact’ car – but due to the unique nature of its design it offers a great deal of space inside, being taller than a BMW X1 with a wider track than a BMW 7 Series. Conceived as an electric vehicle from the very start, the i3 carries nothing superfluous and has all of its components very cunningly positioned to maximise interior room and safety. The first thing anyone wants to know about an electric vehicle is how far it can go on a single battery charge. And in the i3’s case, your initial response may be one of disappointment, with BMW saying it can cover between 80 and 100 miles (approx. 129-161km). Contrast that with the latest Nissan Leaf, which claims 124 miles (approx. 200km). However, not only does BMW quote this figure in terms of ‘everyday driving’, it also says that the included 'Eco Pro' driving mode should increase this by 15%, with 'Eco Pro+' extending it 15% again. BMW has been researching electric car use in the real world since 2009, with prototype programmes involving the MINI E and the later 1 Series ActiveE. And it feels that the i3’s range should be more than enough for the vast majority of daily commutes. This is supported by a UK government report that found the average British daily commute is around 25 miles (approx. 40km). If that still doesn’t satisfy you, there is always the i3 Range Extender, which, with its on-board petrol generator, can travel up to 180 miles (approx. 290km). Both versions of the i3 are powered by BMW’s own design of electric motor, with the Range Extender using its on-board generator to supplement the batteries rather than drive the wheels directly. The motor produces 170hp and 184lb ft of torque, the latter being available the moment you touch the accelerator, ensuring superb response. Since it also weighs just 50kg, it sets a new benchmark for electric vehicles. BMW describes it as smooth running with minimal vibrations and low noise levels. When we think of electric vehicles it’s all too easy to imagine golf carts or milk floats – things that are clumsy and slow. The BMW i3 should dispel this myth immediately. Thanks to that powerful electric motor and a kerbweight of just 1,195kg, the i3 does 0-62mph (approx. 100kmh) in just 7.2 seconds – hot hatch territory. The heavier Range Extender falls slightly behind at 7.9 seconds over the same benchmark, but both reach a top speed of 93mph (approx. 150kmh). The secret to the i3’s low 1,195kg weight is in its optimised construction and the materials that it’s made from. It becomes the first ‘mass produced’ car to be built largely from carbonfibre-reinforced plastic (CFRP) – which is both very light and immensely strong. Formula One cars use similar technology. Other weight savings come from the extensive use of aluminium; forged suspension components save 15% over standard equivalents, for example, while all the screws and bolts are aluminium instead of steel. Conceiving the i3 as an electric car right from the start has allowed BMW to finesse every single element of the vehicle’s design. Take the electric motor – which is exactly as powerful as it needs to be to deliver satisfactory performance and range. Increasing this would also have meant increasing weight. Following in long BMW tradition, the i3 is rear-wheel drive – although in this case the electric motor is also mounted over the back axle, instead of under the bonnet. Carefully positioning the batteries under the floor also gives the i3 a very low centre of gravity, which should aid stability when cornering. This whole story has coverd by msn.com.